What is the evolutionary future of life on Earth under increasing human pressures on natural resources and planetary ecological systems? How do we save endangered species and prevent extinction processes? Research in the Endangered Species Lab emphasizes the ecology, behavior, and population dynamic processes that affect the conservation of biological diversity, especially for threatened and endangered species. We use modern non-invasive analytical techniques and conduct field studies to explore the evolutionary and behavioral processes that influence the ecology of individuals and populations in both managed and natural landscapes. We conduct ecological research on a variety of species and taxa, including birds, mammals, and amphibians. Our work primarily focuses on major population and landscape issues that influence the long-term conservation of species, including the reintroduction biology of threatened and endangered species and the ecological restoration of native habitats. Because we address important research questions and conservation challenges for different species and taxa, we emphasize collaborative, team-based research that draws upon the needed talents of specific researchers, whether conservation geneticists, modelers, or taxon specialists. Our current and recent work focuses on critical wildlife ecology studies in the Pacific Northwest involving Greater sage-grouse, Columbian sharp-tailed grouse, burrowing owls, northern leopard frogs, Columbia spotted frogs, and a variety of western bat species. 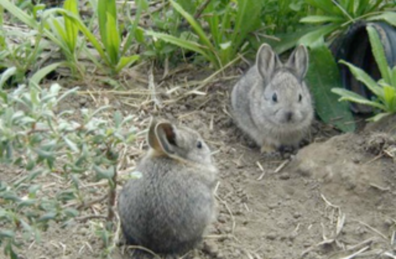 One of our signature endangered species projects involves the population biology and reintroduction of the endangered Columbia Basin pygmy rabbit in eastern Washington.